The Okean-O series were operational satellites for monitoring of ocean surfaces. They were follow-ons for the experimental Okean-E and Okean-OE satellites. achteOne spacecraft in orbit provides a full coverage of the entire Russian Arctic water surface with imagery data for 3-5 days . The satellites were based on the Tselina-D bus and carried an X-band Side Looking Real Aperture Radar, passive MW radiometers and multispectral scanners measuring the emission radiation of the atmosphere/ocean system. RLSBO (3.2 cm) X-band Side Looking Real Aperture Radar with a resolution of 2.1 km - 2.8 km in flight direction and 1.2 km - 0.7 km in cross track direction and a swath width of 450 km. RM-0.8 Passive Microwave Scanning Radiometer for the monitoring of atmospheric water vapor, sea ice, and ocean surface temperature with an accuracy of 1-2 K. The resolution is 15 km × 20 km with a swath width of 550 km. MSU-M (Multispectral Scanner) low resolution instrument developed at ISDE (Institute of Space Device Engineering), Moscow with a resolution of 1.0 km × 1.7 km and a swath width of 1900 km for cloud monitoring and sea surface temperature measurements. It operates in the 0.5 - 0.6 µm, 0.6 - 0.7 µm, 0.7 - 0.8 µm and 0.8 - 1.1 µm spectral ranges. MSU-S (Multispectral Scanner) moderate resolution instrument developed at ISDE, Moscow operating in two spectral ranges (0.6 - 0.7 µm, 0.7 - 0.9 µm) with a resolution of 250 m and a swath width of 1100 km. Kondor onboard data collection system to gather data from DCPs (Data Collection Platforms) from the ground segment. The first two satellites were launched under the Kosmos designation, while later satellites were launched under the designation Okean. 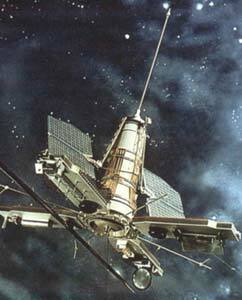 The eighth satellite was renamed Sich 1 and operated as a joint Ukrainian and Russian project. The much larger Okean-O series was conceived as a follow-on, but only a single satellite was built. A modified Okean-O1 was built as the Sich 1M.